Project London2Paris 2013 - All I need is a bike..
Riders have committed, dates have been confirmed, the route’s been chosen, ferry crossings and hotels have need booked, there really is no going back now. This all started as @ASL191’s idea as a way to mark a significant birthday which she’s celebrating in 2013. A few possibilities were discussed, but we soon settled on what’s got to be one of the truly great rides, a box that needs ticking by any cyclist. It’s all too easy to join an organised London2Paris ride, but we want to do it the hard way. Unsupported, and carrying all our kit with us. Doing it this way means that you need the right bike for the job, and whilst the other members of the group all had suitable bikes, I didn’t. I know what you’re all thinking, but I really didn’t want to go down the N+1 route. Instead, I’ve decided to utilise what’s without a doubt the versatile bike in my stable, my On One Pompino. However, loaded up with panniers and on unknown roads leaving this in its current singlespeed spec’ is not really an option. After trawling around on the web for solutions, a gearbox hub seemed the obvious choice. As much a Rohloff appealed, the quite ridiculous price tag ruled this out immediately. It came down to a straight choice between Shimano’s Alfine offerings, and in the end I’ve opted for the 8 speed variant. I just couldn’t justify the extra expense of the 11. 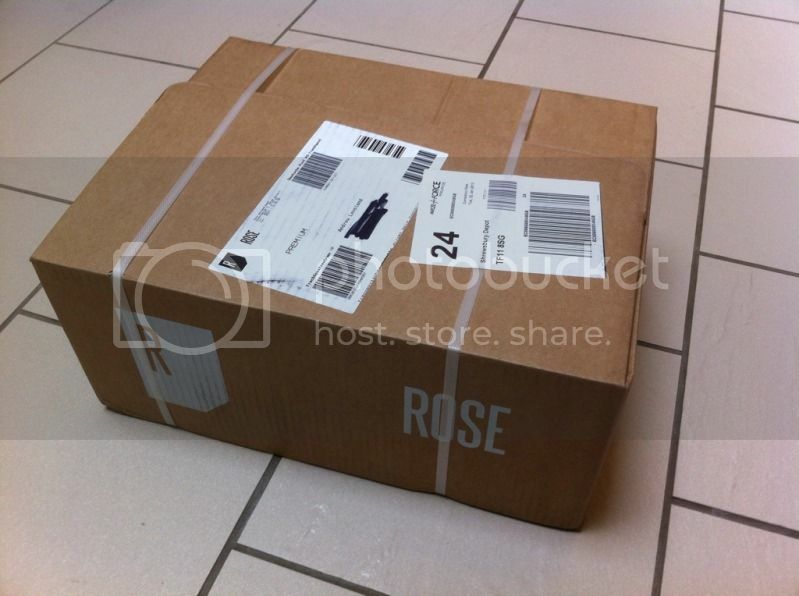 So, the hub’s been ordered from Rose bikes in Germany and is currently on its way courtesy of DHL. All I need to do is get it laced up and on the bike. When it’s built and on the bike I’ll report back. Hang on, what could this be……. Obsession can, and in my case does, take many forms, and this is especially true when applied to the bicycle. Let me explain using numbers. It all started as couple of years ago; slowly at first, but it soon gathered pace. The logging of ride details; Just distances to start with, but scope creep soon took hold. Times were next along with the obvious extension of average speed. In turn of course, it becomes critical to record which bike each ride was completed on. Without this comparisons are meaningless. My downhill spiral into obsession had started in earnest. Resistance was, as they say, futile. I could bore everyone with totals et al, but in a desperate attempt to keep the reader’s attention the following numbers jumped out from my 2012 ride log as worthy of note. 62 – The number of non riding days I enjoyed in 2012. Perhaps more importantly this meant that I got to enjoy riding my bike on over 300 days. That’s certainly going to be hard to better in 2013. 314 – The longest day. Looking back I’m slighty annoyed that this doesn’t read over 320, but 314km was the longest ride of 2012. From Shifnal to Abercovey and back again; crossing an entire country twice, all in a single day. 2645 – The height in metres of the Col du Galibier. On Wednesday 11th July 2012, three members of the Society conquered this brute, experiencing both pain and pleasure in equal measure. Going higher in 2013 is going to be difficult. 953 – As in Reynolds 953 Maraging Stainless Steel. I’m obviously biased, but surely the perfect material to make a bike from. 13,582 – The number of kilometres I cycled in 2012. My initial target for the year was 10,000, but as my obsession intensified, the total kept going up. I also passed 30,000km since I began keeping a proper log at the beginning of 2010. 0 – The number of things I’d change about my cycling year in 2012. It’s not all been positive, but it has all contributed to a truly vintage year. I can only see the obsession continuing into 2013 and well beyond…..